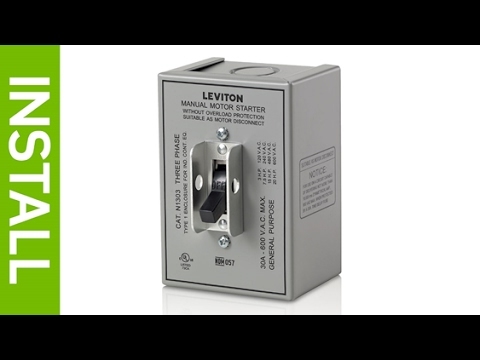 Leviton 2-Pole Industrial grade toggle in AC motor starting switch has voltage rating of 600-Volt AC and current rating of 30-Amps. It withstands dielectric voltage rating of 2200-Volts. DPDT Grounded switch in gray color, has thermoplastic polyester base, face and toggle. It offers resistance to impact, chemicals, temperature, tracking and arcing. With back and side wiring, this switch accommodates wire of size 10 - 8-AWG. It features nickel-plated brass mounting yoke for high strength and corrosion resistance. This switch has silver-alloy contacts for maximum conductivity. It has maximum load capacity of 5 hp at 240-Volts, 2 hp at 120-Volts, 15 hp at 600-Volts and 10 hp at 480-Volts. It measures 3.25-Inch x 2.5-Inch x 4.75-Inch. It is suitable for motor disconnect. Switch operates at temperature range of -40 to 60 deg C. It is UL 94 V0 flammability rated to withstand harsh environmental conditions. 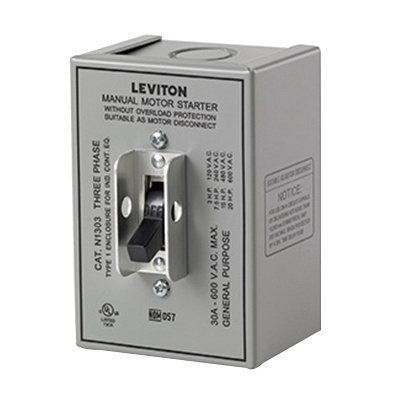 Motor starting switch is UL/cUL listed, CSA/NOM certified and meets ANSI/NEMA standards.